Ecobuild, with long standing success in Asia, is proud to announce the debut of its’ newest event… Ecobuild America, the environmental systems technology conference and exhibition. The event will take place June 20-23, 2005 at Disney’s Coronado Springs Resort in Orlando, one of only 4 certified Florida Green Lodging locations. GreenBrevard supports the event as a media sponsor and there is still time to be an event sponsor, gaining you tremendous international visibility. Ecobuild America covers the breadth of commercial, industrial, institutional and residential green building techniques, construction products, renewable energy resources, and sustainable growth design and planning processes. Product educational sessions for design and construction professionals will feature the latest innovations in green building materials and energy and technology, with particular emphasis on sustainable growth, green building, and environmental design. This gathering promises to feature the most comprehensive congregation of green building programs and technologies ever assembled — a showcase for this rapidly expanding and dynamic industry. Even though the Ecobuild event is new in America, our parent in Tokyo predates Greenbuild and is quite a bit larger, drawing some 16,000 to the last event. However, it is not our intent to compete with Greenbuild, in fact Tom Paladino, USGBC Board Member and Author of the LEED Reference Guide will be delivering our keynote address. USGBC will also host a number of full day LEED Workshops. To see the various levels of sponsorship and the entitlements you could gain, please refer to page 3 of the Ecobuild prospectus. 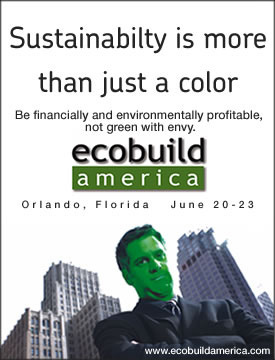 Visit www.ecobuildamerica.com to learn more. Be sure to check out all the co-located events held in conjunction with Ecobuild America such as The National Specifiers Conference, sponsored by SCIP, M6 Mold, Moisture, Misery, Money, and Myth – Plus MANAGEMENT sponsored by the Building Environment and Thermal Envelope Council, a committee of the National Institute of Building Sciences, AEC Science and Technology, and more.